Item # 312592 Stash Points: 2,195 (?) This is the number of points you get in The Zumiez Stash for purchasing this item. Stash points are redeemable for exclusive rewards only available to Zumiez Stash members. To redeem your points check out the rewards catalog on thestash.zumiez.com. Skate hard from the vert sections to the local street spots on the Royal The Royal Crown 5.25" Skateboard Truck. Durable hangers offer ample clearance from hanger to bushing cup for longevity and hang-up free grinds. Finished with a reinforced, forged base plate as well, you'll be riding these trucks for a very long time to-come. 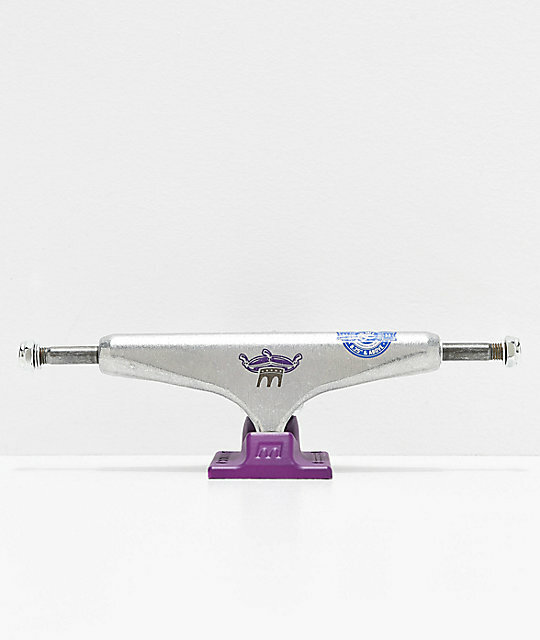 The Royal Crown 5.25" Skateboard Truck from Royal Trucks. Custom crown on a pillow graphic on hanger. Best when used on skate decks that are 8.00" to 8.5" wide. Note: Order quantity of 2 for a set!